Last month I had the opportunity to combine two of my greatest passions – history and running – in an unforgettable run around the Gettysburg National Military Park – the nation’s shrine to the turning point in our history as Americans. 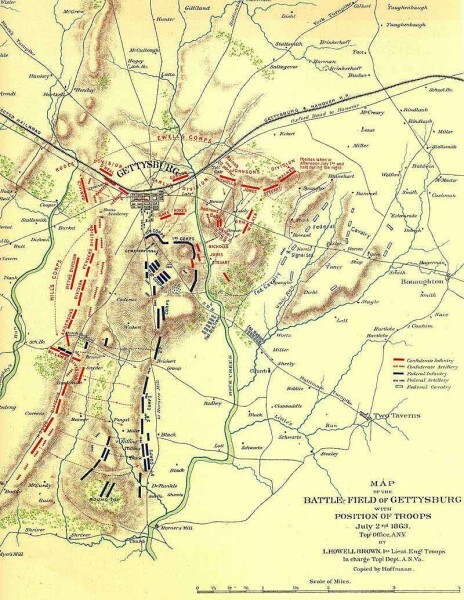 The Battle of Gettysburg, which took place over the course of three days in early July, 1863, is bookended (almost precisely in the middle) by the first shot at Fort Sumter in April, 1861 and Lee’s surrender at Appomattox Courthouse in April, 1865. On a grander, more sweeping scale, it marks the end of the first third of the “American Experiment” and the beginning of the most recent two thirds. North vs. South, Blue vs. Gray, Meade vs. Lee, brother against brother – 72 hot and dusty hours, culminating in the mind-boggling slaughter of over 40,000 men – nearly equally distributed between Union and Confederate forces. It was the “high water mark” of the Confederacy, when the rebels took the fight to Northern soil. Commanding General Robert E. Lee fervently believed that “The Late Unpleasantness” would cause the citizenry of the North to tire of the war, resulting in a political crippling of Lincoln and his generals. More importantly, Gettysburg was possibly the last great Union stronghold separating the Confederates from Washington, D.C. and Southern victory. The South had dominated the first part of the war, thanks to the brilliant leadership of its general officers, but was swiftly falling victim to cold statistics. In terms of population, the North outnumbered the South 22 million to 9 million (3.5 million of whom were slaves). Industrially it was even bleaker. In 1860, the North manufactured 97 percent of the country’s firearms, 96 percent of railroad locomotives, 94 percent of its cloth, 93 percent of its pig iron and over 90 percent of its boots and shoes. The North had twice the density of railroads per square mile. Moreover, there was not even a single rifle works in the entire South. Since gunpowder ruled the day and gunpowder was imported, the South was at an even greater disadvantage as the Union possessed overwhelming naval strength and could blockade the strategic ports of Wilmington, Charleston, Savannah and Mobile almost at will. It is a testament to Southern leadership and resourcefulness that the war lasted as long as it did. The North faced its own struggles as well. Unlike the Gettysburg scenario, the Army of the Potomac was the invading force for a vast majority of the war and as in any war, the invading army stands to face far greater casualties than the defending army. The Confederacy made up an area larger than all of Western Europe which created a logistical nightmare as the Union army had to invade and occupy the South in order to win the war, while the South simply had to outlast popular support for the war which was tenuous in the North even at the beginning of the conflict. Union leaders had the difficult task of motivating Northern farm boys and factory laborers far from home to take the fight to an enemy they did not hate in a war they may not have even understood. America as idea – a collective – as we know it today was still an emerging concept at the time. The emphasis then was devotion to State and to community. For the South, motivation was easy – “defend the homeland!” Great Britain and other European powers, eager to see a still-young American nation humbled, offered overtures of support to the upstart Confederates. Overly cautious, often ineffectual generals and an impatient, highly critical President led to a revolving door of commanding officers, grinding instability and increasing public frustration with the Union war effort that most thought would last a only few weeks early on. Enter the theretofore unassuming Southern Pennsylvania crossroads known as Gettysburg. A Union army in dire need of a big win, desperately attempting to defend the capital and turn the tide of the war – A Southern army at its zenith, facing dwindling resources, wild-eyed with anticipation, looking for the knockout blow.